A celebration of frightfully fearful images, compiled by some of the biggest and most respected names working in the genre. From early engravings, via dust jackets, book illustrations, pulp magazines, movie posters, comic books and original paintings, to today’s artists working entirely in the digital realm, there are some 400 images presented in The Art of Horror, from the shockingly lurid to the hauntingly beautiful. Vampires, werewolves, zombies, ghosts, devils, serial killers, alien invaders and many more: every aspect of the genre is represented in all its gory glory. 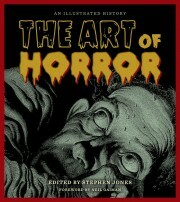 Multiple award-winning editor Stephen Jones and his stellar team of nearly 100 contributors — both writers and artists — have sourced visuals from archives and their own private collections, ensuring an unprecedented selection (including many rarities and a number of previously unpublished pieces) which, alongside the authoritative text, builds into a unique and fascinating history of horror. With an exclusive Foreword by Neil Gaiman, the award-winning author of The Sandman comic book series, and the novels American Gods, The Graveyard Book, and The Ocean at the End of the Lane. This coffee table book contains the various types of art from oils on canvas to sketch drawings to even the digital designs of today. And each design picked is a beauty to behold . . . If you’re a fan of things that go bump in the night, the works of H.P. Lovecraft, or anything related to the world of horror for that matter, this is the book for you. This is a really fabulous collection of pieces that show just how far horror has stretched it tentacles through the art world. As you might expect, there are plenty of full-colour movie posters, one sheets, and other motionless visuals associated with moving pictures, horror’s main medium. However, Jones also invites a diverse array of classical and modern artworks, comic and pulp novel covers, Halloween cards, engravings, and more to the mad monster party . . . As the title tells, art is the point behind The Art of Horror, and there is a truly grotesque and gorgeous assortment here. Editor Stephen Jones leads us through the art history of horror in a nutshell (from cave paintings, via the Egyptian hieroglyphics, the ancient myths and legends, to the horror releases of today), and what follows is a review all of the major manifestations of the art of horror . . . all this is presented in an elegant hardcover and on glossy paper. As I said: the perfect gift. The marvelously massive anthology weighs nearly four pounds and boasts a lovely matte paper stock with impeccable image quality . . . The Art of Horror enchants page after page with vivid, deep-hued color photos, historical passages and illustrations representing art, literature, film and other realms of the horror genre . . . Beasts, demons and ghosts are brought into context, offering a great primer for teens and pre-teens and non-horror enthusiasts. A fine addition to your coffee table or coffin lid, The Art of Horror: An Illustrated History, edited by Stephen Jones, is a horror connoisseur’s choice of movie posters, comic books, paperback and dust jacket art, pulp magazine covers, and ancient and contemporary art that gleefully dwells on the morbid predilections of the frightening genre so many fans clamour for yet know little about . . . Each chapter provides a concise overview to its topic and ends with a reflection on a key aspect within that topic, and is profusely illustrated with captioned literary and cinematic examples, both foreign and domestic, of the terrors by day and night in all their lavish colours and dread. Full page art, double-page art, and smaller illustrations filling pages, do their best to overwhelm your visual cortex. While on first appearance it may seem so, The Art of Horror not your standard coffee table style art book (which the world is in no short supply of). Jones elevates the book by adding a strong critical component. Rather than present a hodgepodge of pieces, Jones has collected the works into ten carefully curated sections, taking it a step farther by assigning each section a writer to add to it a cultural and historical context . . . There is a wealth of both familiar and beloved as well as rare pieces of art to flip through, ranging from the 1800s to today and covering nearly every trope in horror (from vampires, zombies, werewolves to ghosts, psychos, demons, and aliens). Even the most seasoned veteran of horror art history will be sure to find a few new pieces amongst the collection. In order to fully realize this title’s ambitious scope, it would take an experienced and dedicated editor who could assemble an unparalleled roster of writers, editors, film-makers and artists to offer fascinating and detailed essays richly illustrated with hundreds of images of rare artwork. Stephen Jones and his collaborators have done just that, producing a book that will most likely come to be regarded as the essential volume. Often labeled as trash by the mainstream, The Art of Horror proves otherwise; this showcases superb work by immensely talented people, and richly brings your fears to life . . . This is a serious celebration of the genre, and a must-have for those who love things that go bump in the night. 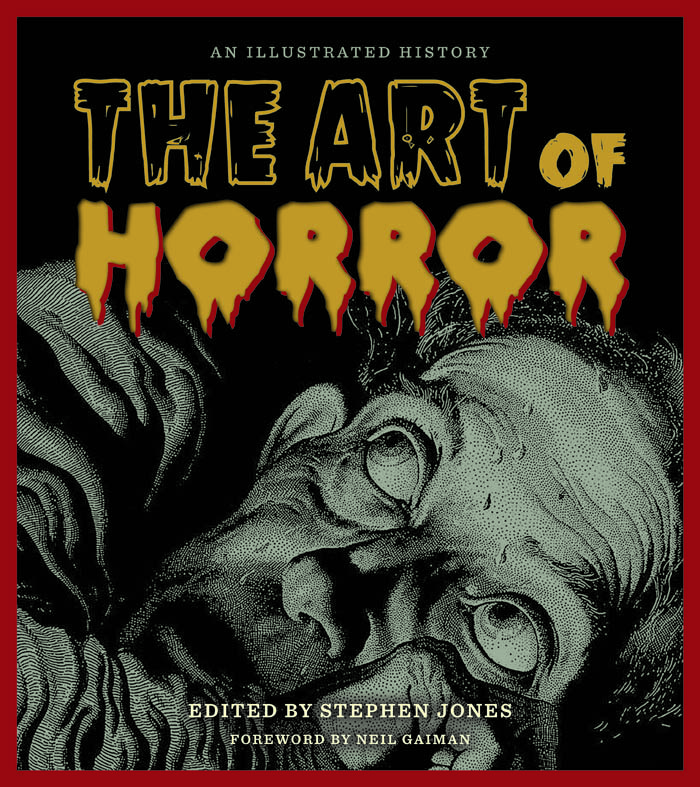 The Art of Horror: An Illustrated History is one of those perfect books that showcase great artists and their works while shedding light on the cultural implications of the decade those works were created . . . It’s the perfect gift and a must-have for any lover of art or pop culture historian that deals within the realm of horror. Elegantly designed and laid out, this glorious exploration of horror should be top of every true horror fan’s shopping list. It not only encapsulates the horror genre but goes some way to explaining its fascination and, without doubt, shows it at its very best. Hats off to every contributor in this tome and especially to Stephen Jones who once again shows that when it comes to horror, there is no greater exponent of its heart.